After nearly 10 years to the day, the edited collection I’ve been working on is available in Canada, the US, the UK and Australia. I remember well sitting at my desk looking out to Lake Banook in Dartmouth, NS and realizing that the original idea for my PhD dissertation was too big, and that I was going to have to hone in on contemporary reading groups instead of following my interest in historical ones. There just wasn’t enough room in one book. More importantly, I didn’t have the historical expertise that I felt was necessary. My idea was to create a book that I could be a part of but one that I didn’t have to write on my own. I contacted scholars I’d met at various SHARP meetings, and invited them to share their work in a collection that I would edit. From Salons to Cyberspace, which was the original name of the collection, was well received by those I contacted. I easily found an editor at a Canadian university press the next summer, but that’s when work on my PhD really became intense and I was up for reappointment (the end of my probationary period) at MSVU. 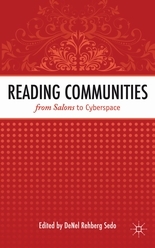 Salons to Cyberspace went onto the back burner even though most of the contributors were prompt and professional in writing their chapters. Over the next few years, I was wrote a proposal for and was granted monies to build the Atlantic Canada Communication Issues Research Lab. Danielle Fuller and I also began our funded international project called Beyond the Book. During my first sabbatical, I was able to really dedicate time and effort to what, by that time, had become “Salons”. But by then, I’d lost an author who wanted her work published elsewhere, and I had two editors at the press I was working with leave. I began to lose sleep over the collection because there were careers at stake. In 2010, and after two rounds of reviews and revisions, the press I was working with declined the collection. There wasn’t enough Canadian content in it, which made it impossible to acquire publishing subsidies through the Aid to Scholarly Publishing Program. Two readers were extremely supportive of our work, but one wasn’t, and, in today’s Canadian scholarly publishing world that meant the press wasn’t willing to take a chance on our book. I could have paid $5000 to cover the costs, but that would have meant teaching extra classes and taking away time from all of my other research work. Instead, I sent the manuscript to Palgrave Macmillan, and within 14 months, we’ve got our book out into the great big world. From Paula, the publisher, to Ben, the editorial assistant, and from Barbara, my editor to the Holly, the Author Care Co-ordinator, I feel that the final part of this publishing process has been a joy. I’m hopeful that students, researchers and anyone else who may be interested in reading, reading practices, reading history and reading research will find the essays useful and appealing. There’s a lot of solid work represented in this book–not only mine but, that of three student assistants and well-respected researchers and writers who I’m lucky enough to have had on this crazy ride with me. Thank you, Julie, Leslie and Janine. Thank you Betty, Bob, Jenny, Anna K and Anna I, and, thank you Daniel, Linsey, Danielle and Claire.